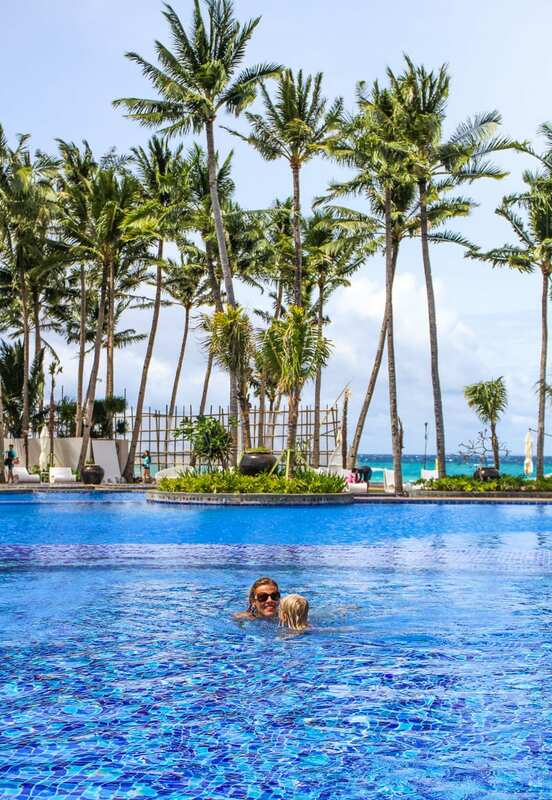 If I had to describe the ideal resort for traveling with kids, The Movenpick Resort on Boracay Island would be it. 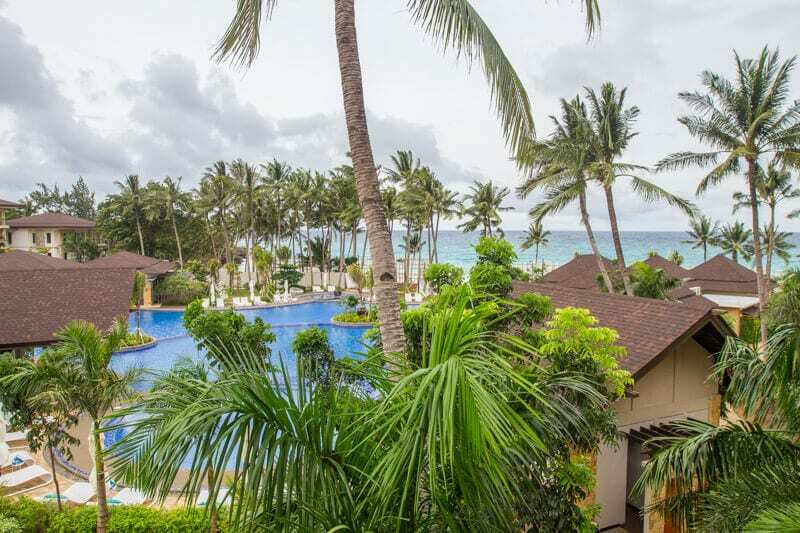 We had the most fantastic, albeit short, stay at this family resort on the beautiful Boracay Island. Kalyra and Savannah continue to talk about it almost every day and keep asking when we can go back. 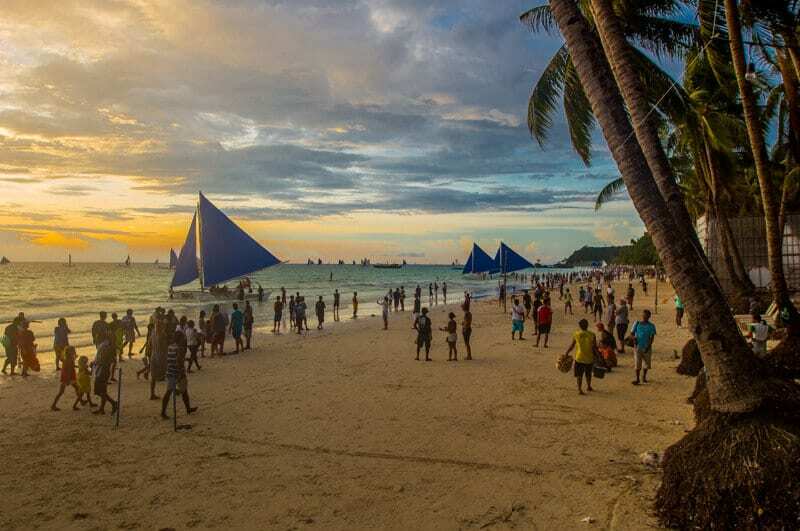 The Philippines is a destination entrenched in their memories as a place of fun, friendly people, beautiful beaches, lots of adventure, and the biggest pool they’ve ever seen! 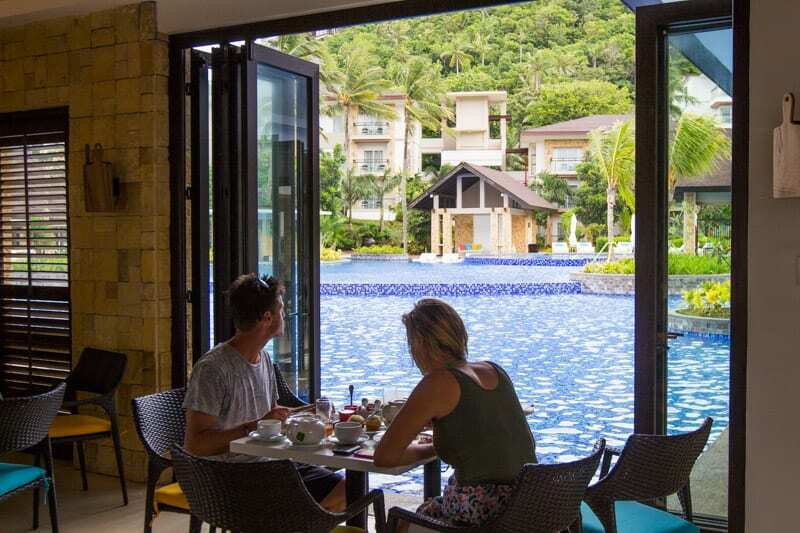 We stayed as guests of Movenpick Boracay. 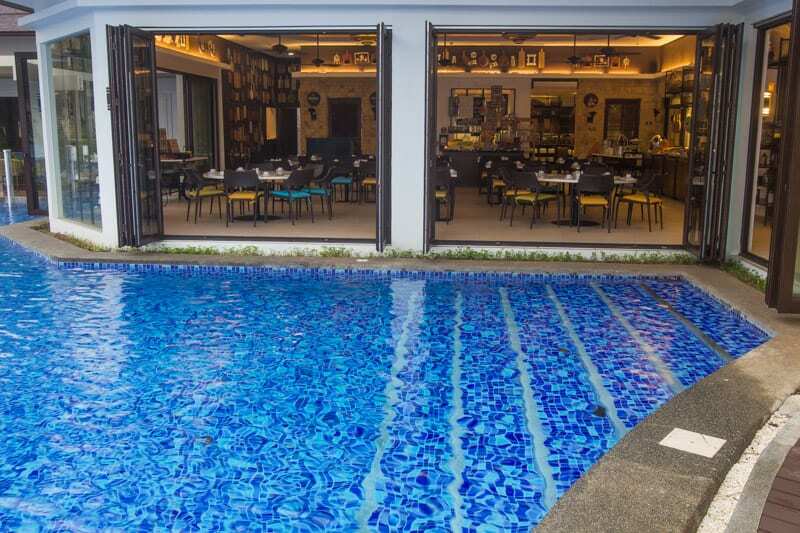 In this post, we’re sharing our personal experiences of the resort and the reasons why we loved it and think it’s the best place to stay on Boracay Island. Punta Bunga had the wow factor for me. I fell in love with it and thought it was the best beach in Boracay. 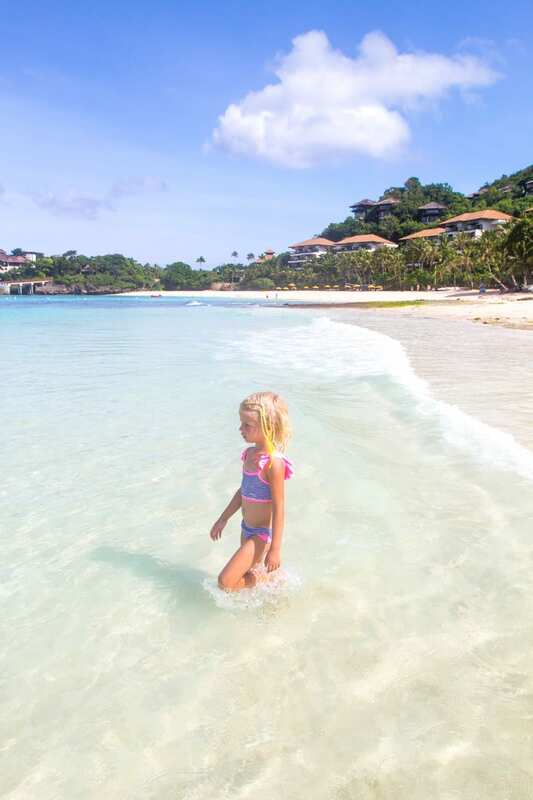 With its crystal-clear waters and soft white sand, Punta Bunga is unspoiled and idyllic. When the sun came out, we headed straight to the beach to lap it up. 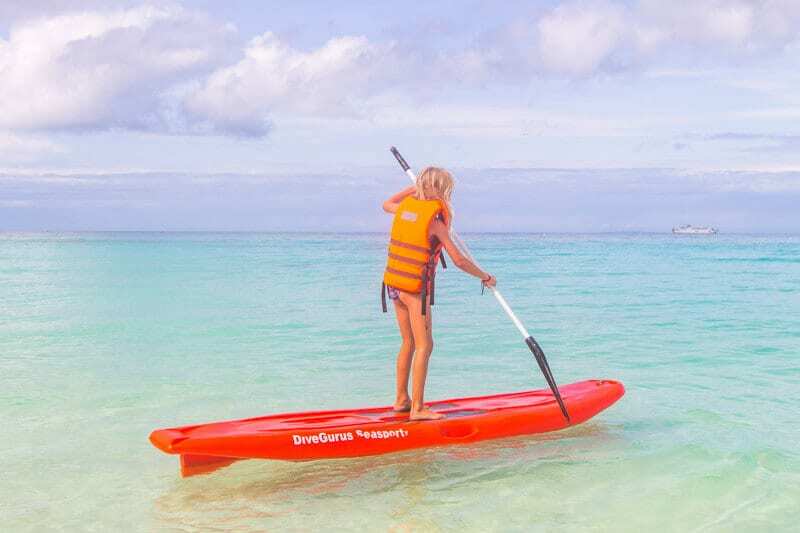 Kalyra jumped on the stand-up paddle board, and I grabbed the kayak for a solo paddle to explore some of the beaches south of Punta Bunga heading towards Diniwid Beach. 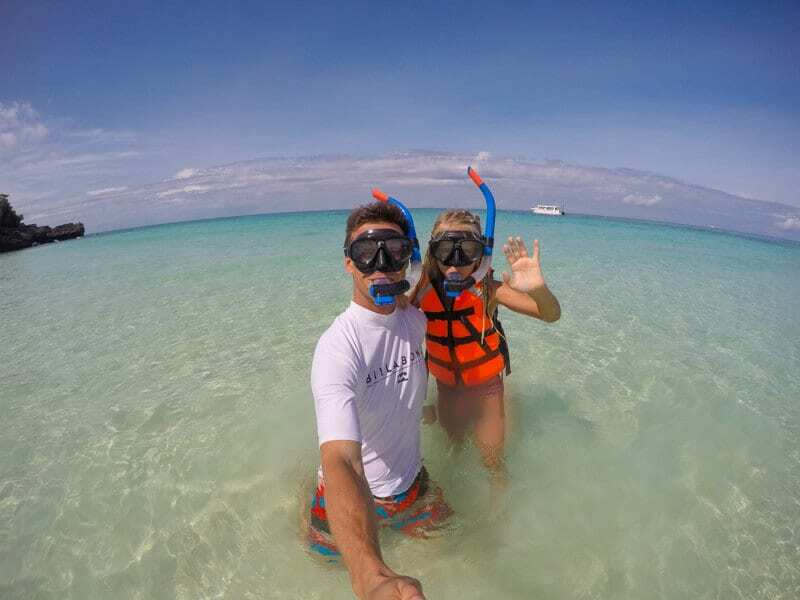 There is a set allocated time each day when the snorkelling gear is for free. 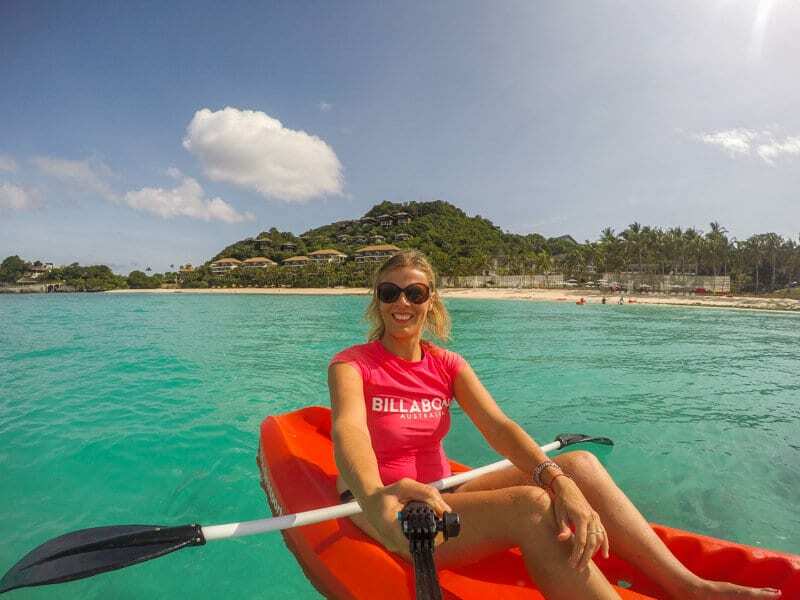 The paddle boards and kayaks are available for rent. There are also beach chairs which won’t cost you expensive shakes to use each day like our one at Puka Beach did. As it’s a private beach, you won’t be dealing with maddening crowds either. 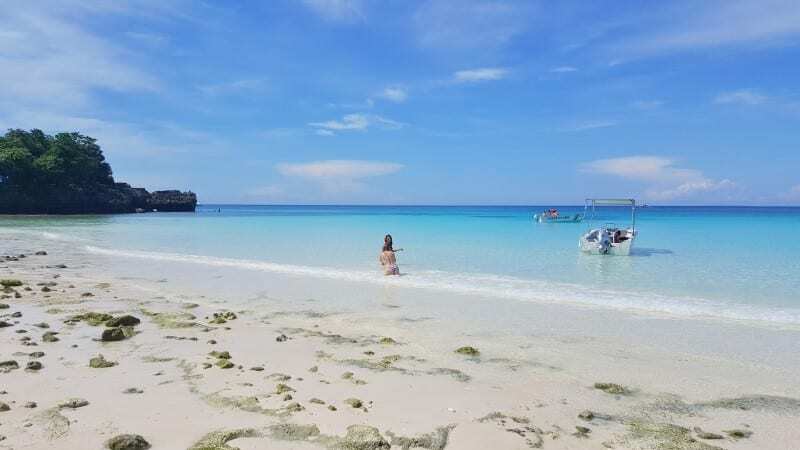 White Beach felt crowded to us, and we visited in low season. Due to the overcast weather on our trip, we didn’t see it in its white shining glory. It looks stunning in other pictures I’ve seen. However, it was just too busy for me. It would have been perfect when I was a solo traveller, and I would have been amongst the bean bags lying on the beach floor with buckets of beers beside me for sure!! It’s not what I’m after now. There are lots of choices in Station 2 on White Beach for food, and a sunset stroll along the beach is worth an experience. I recommend families visit here, but I love that the Movenpick Resort gave us the chance to escape the madness. If you want to go into White Beach, the Movenpick makes it easier with free shuttles all day. The run every hour until 5 pm when they run every half an hour. 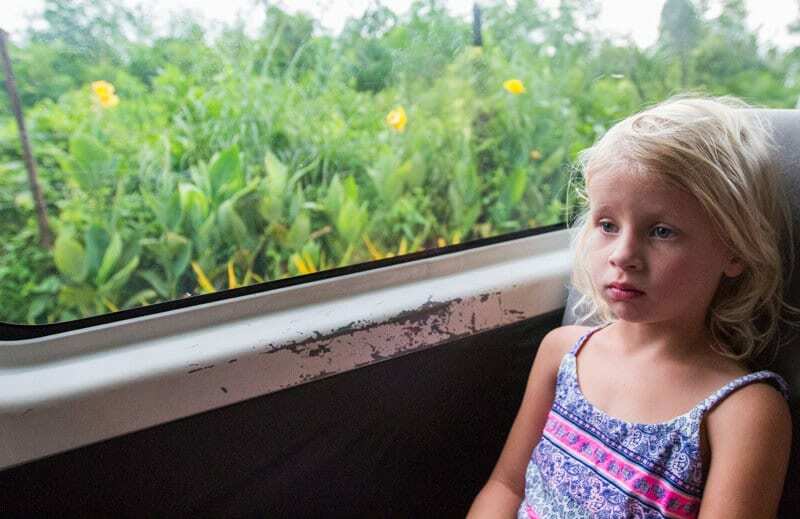 It’s a short 20-minute drive into White Beach, and you get to gaze out the window at village life as you go by. Savannah had a hard time understanding that the goats and chickens she saw running around were not on a farm but lived in the village. The Movenpick Boracay hasn’t even officially opened yet!! The grand opening is in February. Previously, one of the buildings was Sol Marina Resort, but Movenpick has taken over management to reconstruct the resort and add in facilities and rooms. It meant the resort was super quiet for us with only a few guests visiting during their soft launch phase. It also meant there was a bit of construction going on around us, but absolutely nothing that disturbed our peace. One exciting feature they plan on having completed by opening is a beach bar with live music. Sol Marina Beach Club will be the place to party in the company of international DJs and performers. It was very challenging to pull the kids out of the pool each day. We wanted to explore the other beaches on Boracay, but they wanted to swim from one level of the pool to the spa and back again. 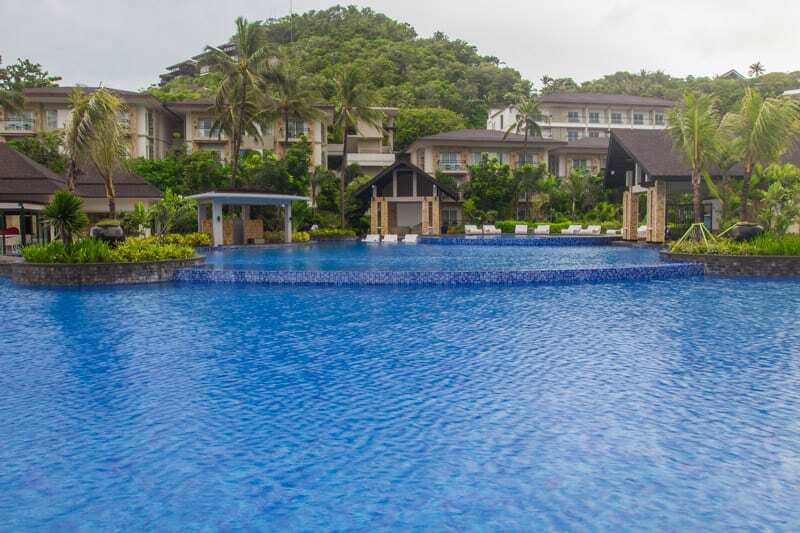 At 3,300 sqm, the multi-level swimming pool boasts its title as the biggest resort pool on Boracay Island. It was the biggest resort pool I’ve ever seen. You have views out to the ocean, a swim up bar, plenty of lounge chairs – I especially loved the ones in the pool – and lifeguards!! 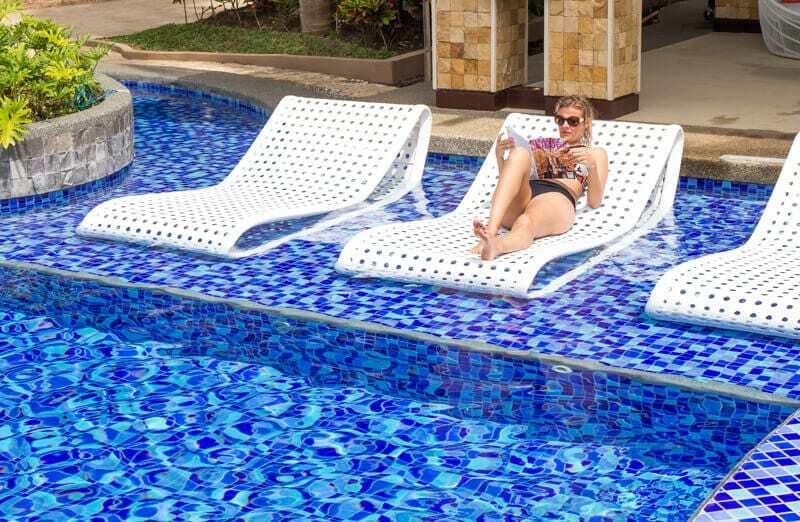 Mums – how luxurious does laying down on a poolside chair reading a book sound? You can do it at the Movenpick. 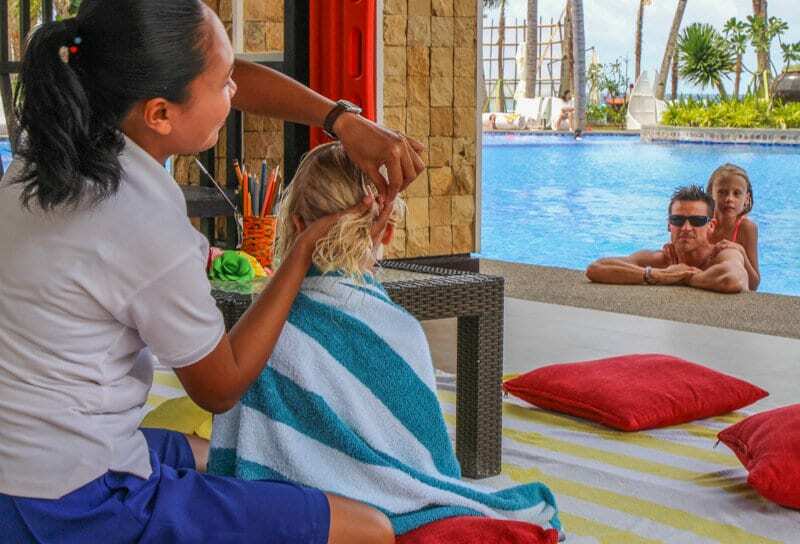 The kids will have a ball swimming in the pool, the lifeguards will take care of their safety, and then when they’re waterlogged, they can sit in the poolside cabana for kids. The staff will teach them art lessons, chat and crack jokes with them and braid their hair. I was tempted to ask if they’d braid mine too. Our girls adored hanging in the kid’s area and the attention they received. A newer, more permanent Kids Club is in the middle of construction and when completed It will be pirate themed and will be called Pirates Cove. They say the sweetest word anyone can ever here is their name. I was amazed at how the staff remembered each of our names, even if they only briefly met us by the pool. The next day when they saw us, they’d be saying, “Hello Savannah, Hello Kalyra!” I was super impressed. As soon as you arrived at the pool, they’d greet you with a smile, and set up a chair for you with towels and beach umbrella, bring out fruit snacks around the pool, and engage in conversation with you. The service was outstanding in all the restaurants. 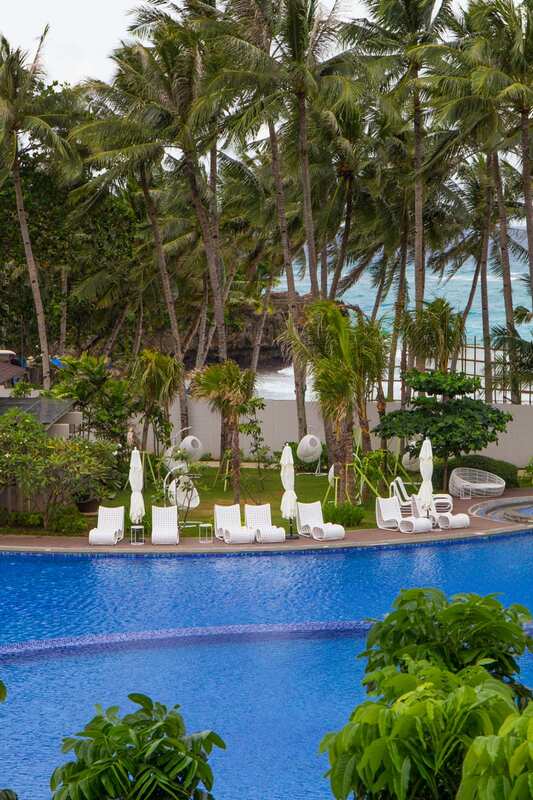 You felt like part of the Movenpick Boracay family. They sure do make you want to go back. I’m not a chocolate fan, so this feature of the Movenpick Boracay was not so exciting for me. Different story for the other three members of the Makepeace tribe! Take yourself up to the cafe every afternoon at 4 pm and fill up your plate with as many chocolates as you can fit in. I did try the chocolate mousse which was divine and the perfect amount of chocolate for me. Oh, and I did like the chili chocolate!! Savannah, not so much. 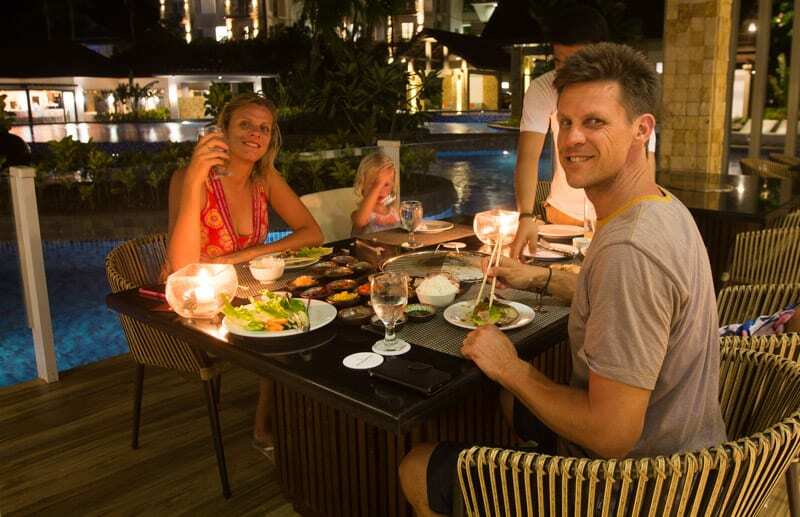 We opted to eat in at the restaurants for a couple of nights. The girls were tired and didn’t want to go into White Beach for dinner. To be honest, I didn’t either. I was so happy just to stay in the one place and relax. 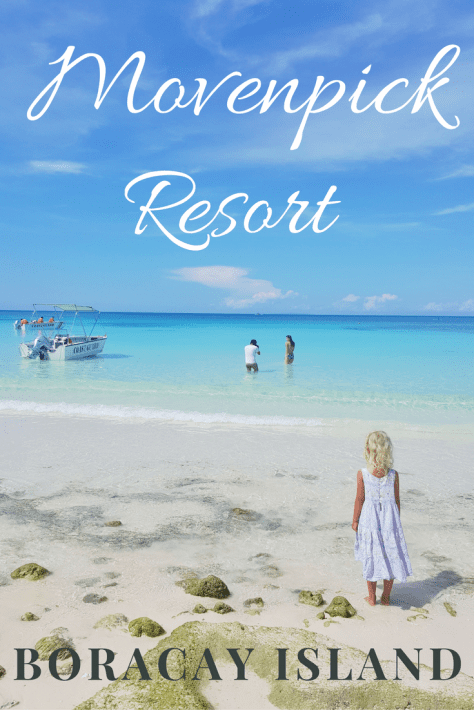 It’s so rare we get to experience a family holiday like this in a gorgeous resort where we are not always moving and doing a lot of stuff! 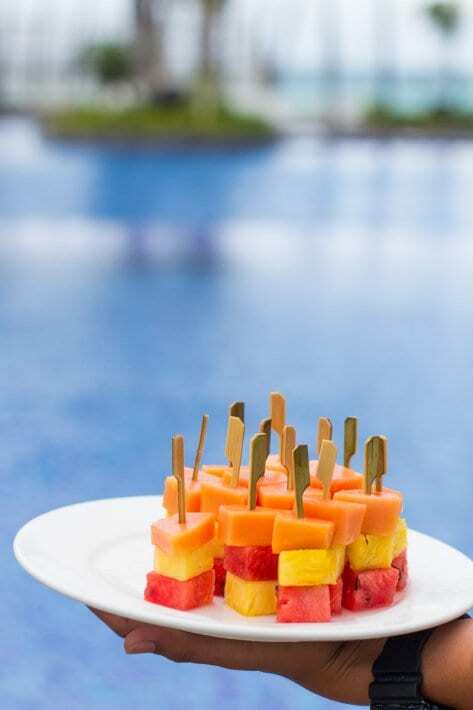 The Movenpick has a wide variety of choice for places to eat. The Market is the all day dining restaurant, and the place for the buffet breakfast. Ssäm serves Korean BBQ. It was our first experience of this, and we loved it. 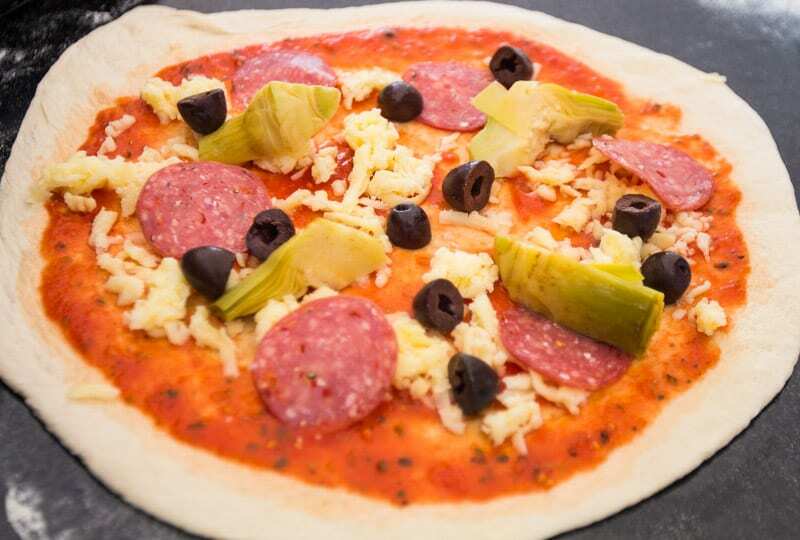 The La Riviera is the place for good Italian, especially their wood fired pizzas. 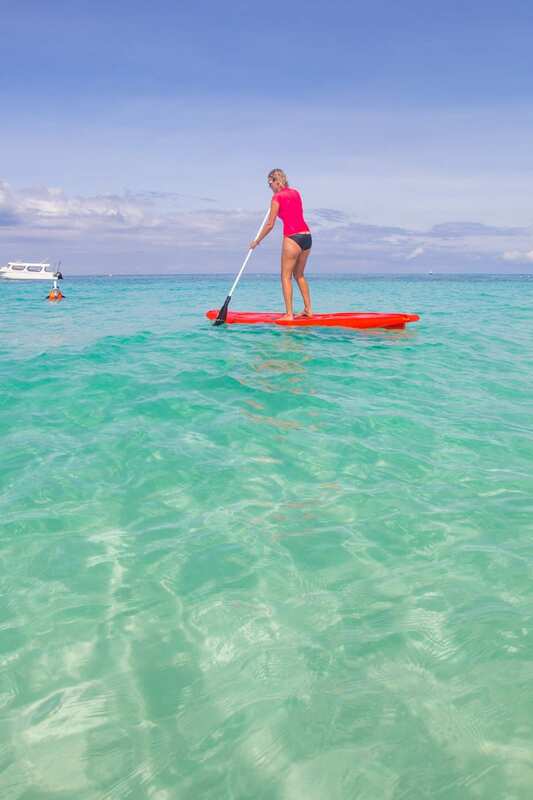 The Movenpick has plenty of tours and activities on offer that you can pay extra for. 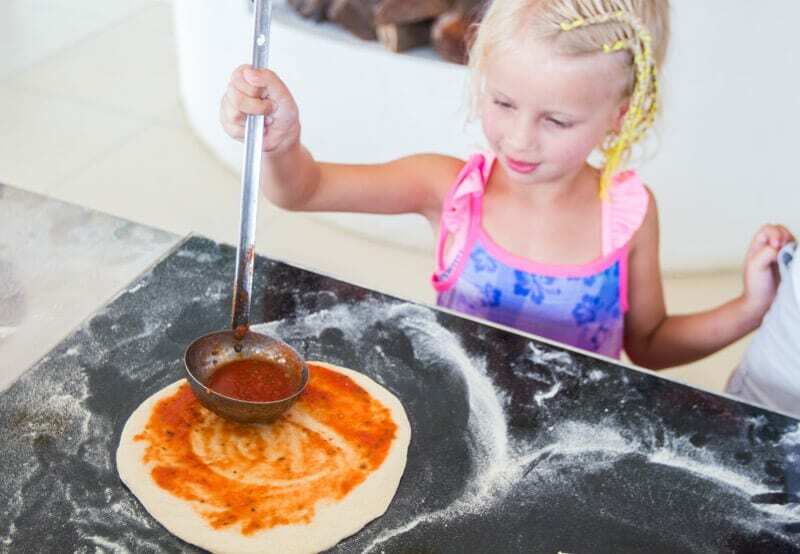 Two of the activities that we loved and are available upon request were the pizza making classes and the cocktail and mocktail classes. Savannah is the world’s fussiest eater, but she adores cooking. If you follow our Instagram stories, you’d see Savannah and I cooking together a lot (@ytravelblog, @carolinemakepeace). BUT, she often never eats what we cook. 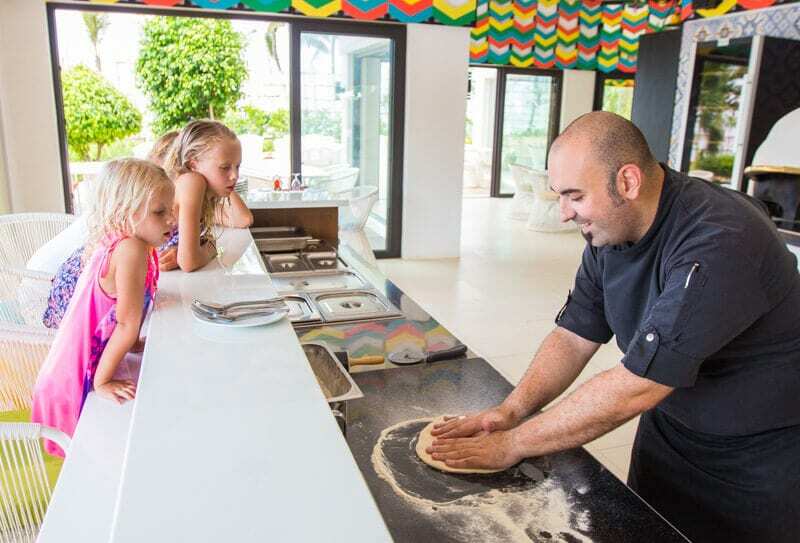 She loved cooking pizzas with Francesco, the Italian Chef at the La Riviera restaurant in the Movenpick. He taught us how to cook a traditional Italian pizza in a wood fired oven. Savannah nailed it AND ate her pizza after. It’s the first time she’s ever eaten pizza. We were celebrating. The girls also had a blast learning how to make Shirley Temples and a Thirst Aid. I quite enjoyed tasting the Tequila Sunrise and the margarita that the award-winning cocktail maker and sommelier made for us. And by award-winning, I mean like Tom Cruise in Cocktail throwing the bottles around! Nothing pleases me more than to be picked up from an airport and transferred privately to our hotel. Nothing. Especially now we travel with kids and persist in carrying too much luggage!! We were going straight to South Australia from Boracay so unfortunately had to bring all our winter gear. A boat took us to Boracay and then a shuttle to our resort. There are a variety of different room types at the Movenpick including Superior Room, Deluxe Room, Junior Suite, Sol Marina Beach Suite, and a Royal Beach and Pool Villa. The rooms are modern, spacious, clean and beautifully decorated and come with free wifi. We loved the super sized bathroom and the ocean views from our balcony the most! 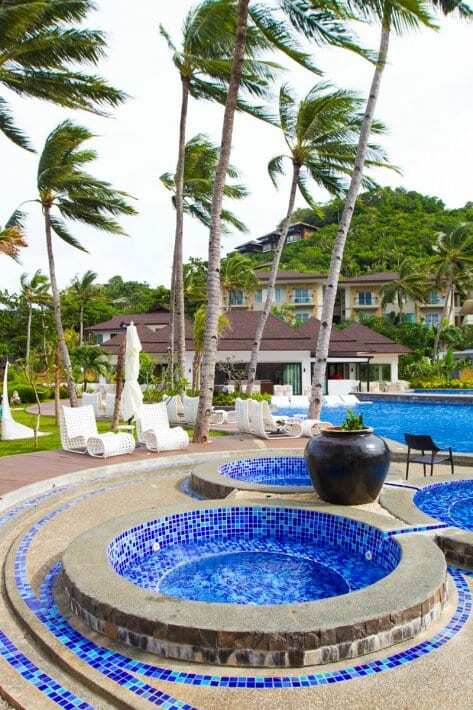 Book your stay at www.movenpick.com/boracay and find out their special offers for any season. 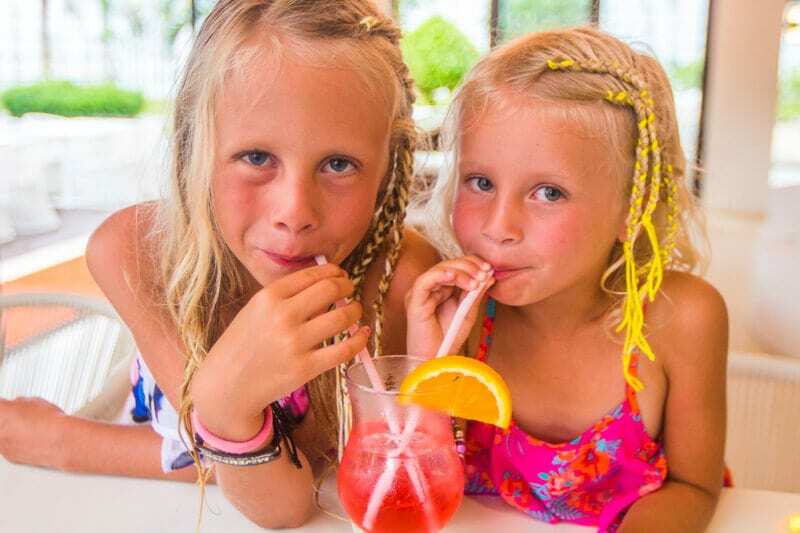 What’s your favourite feature of a family friendly resort? it’s impressive you have done so many tours already and keep planning. I’m sure you are a fantastic guide, lucky all the few that will be able to go around with you!! This is an excellent concept, Earl. You’ve essentially created a market for valuing travel expertise. For all those travel startups who want my free time to evaluate their business plan, I’m sending them here. I love it. I’m sharing on Twitter, FB, etc.